The Churning of the Ocean is one of the most popular stories in Hindu mythology and has been celebrated for centuries in the form of the famous Maha Kumbh Mela. It describes the second incarnation of Vishnu- the Kurma Avatar . It was when Vishnu took the form of a turtle to save the earth. Beautiful carvings and sculptures depicting scenes from this story have been found in many ancient temples in India and in other parts of the world. Like this one from the Angkor Wat temples of Cambodia. And, even in a modern day airport like this one! For those who haven’t heard or read the story before, here it is…. One day when Indra, the King of Gods, was out riding on his elephant, he met Durvasa Muni, a very learned sage. Durvasa offered Indra a divine garland of flowers. Indra who was lost in his own grandeur did not understand that Durvasa had honoured him by doing so. In his ignorance, he took the garland and placed it on his elephant’s trunk. The elephant intoxicated by the heady scent of the flowers took it and flung it to the ground and trampled upon it. Durvasa was enraged at the insult. He cursed Indra that all the devas( gods) would lose their powers. Indra quickly realised his mistake but the curse once spoken could not be revoked. The devas became weak and powerless while their arch enemies the Asuras became stronger with each passing day. Desperate and now fearing for their lives, the gods approached Brahma and Shiva for help, who in turn sent the devas to Vishnu, the Protector of the Universe. Vishnu saw the plight of the devas and knew that the balance between good and evil had to be restored. There was a way, Vishnu told the devas, to get their powers back. They would have to churn the great cosmic ocean of milk, Ksheer Sagar and bring out the nectar of immortality that was hidden within it. On drinking this nectar ( Amrit), they would become invincible. The devas were worried now. How could they possibly churn the great ocean ? “You must use Mount Meru, which stands at the centre of the Universe, as your churning staff and request Vasuki, the King of Snakes to be the churning rope,” Vishnu added. He asked the devas to join forces with the Asuras and promise them an equal share of the nectar, if they helped with the churning. “But that would make the asuras immortal too! ” cried the devas. “The asuras will not get the nectar,” Vishnu assured them. The devas bowed down to Vishnu and left Vaikunth. On hearing about the plan to obtain the precious nectar, the asuras got all excited and readily agreed to help. Together they set upon the task. First they gathered many precious herbs and added them to the milky waters. Then they went to Mount Meru and lifted it in an attempt to carry it to the ocean but the devas could not hold it up and the mountain collapsed upon them, crushing thousands of devas and asuras. Seeing this terrible calamity, Vishnu appeared on his celestial vehicle Garuda, the eagle. With one finger Vishnu lifted Mount Meru and placed it on Garuda’s back, who then flew it to the centre of the ocean. 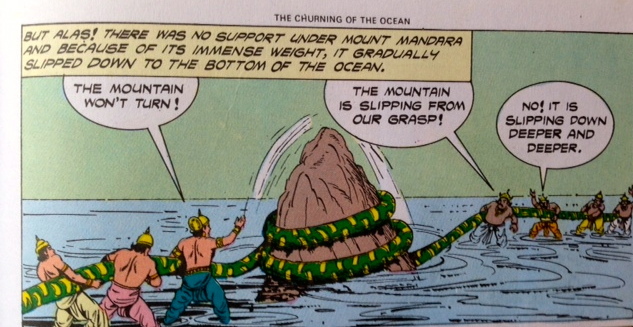 With Vasuki coiled around the mountain, the churning finally began . 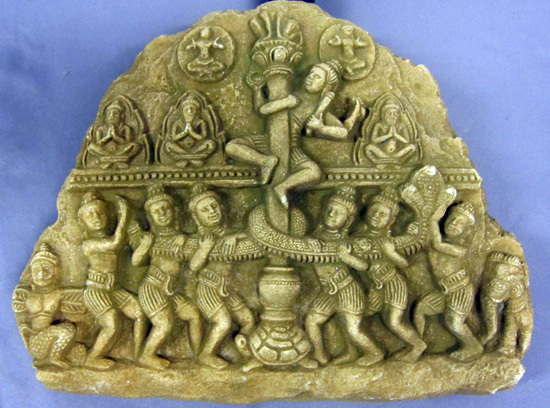 The asuras insisted on pulling from the head of the snake so the devas took the tail. They heaved with all their might, tugging back and forth till the ocean began to turn, its waters rising in enormous waves. However, now the mountain began to sink, dragging everyone with it. Once again, Vishnu came to their rescue in the form of a gigantic turtle. This was Vishnu’s third incarnation, the Kurma Avatar. He started spewing smoke and fire from his thousand mouths, engulfing the asuras in poisonous fumes and choking them. But no one would give up.The churning continued. Then a large cloud of the deadly poison Halahal, arose from ocean and spread all over the Earth, threatening to destroy all creation. Cries for help reached Mount Kailash where Shiva sat in deep meditation. Hearing the commotion , Shiva woke up from his trance. He saw the poison spreading and quickly gathered it all in his hands and swallowed it. So deadly was the poison that it burned Shiva’s neck turning it blue. ( Since then Shiva is also called Neelkanth, the one with a blue neck). The devas and asuras pressed on with the task. Before long, a number of different treasures emerged from the Milky Ocean. These included Kamdhenu, the divine cow; Kalpavriksha, the wish-fulfilling tree; the wonderful Parijat whose blossoms never wilt and the precious gem Kaustubh worn by Vishnu. They were followed by a bevy of beautiful nymphs and Varuni the goddess of alcohol. Then came the radiant Laxmi, Goddess of wealth who married Vishnu. Finally , there arose Dhanavantari, the divine physician holding a pitcher of nectar in his hands. Seeing the pitcher the asuras rushed ahead and took it by force. 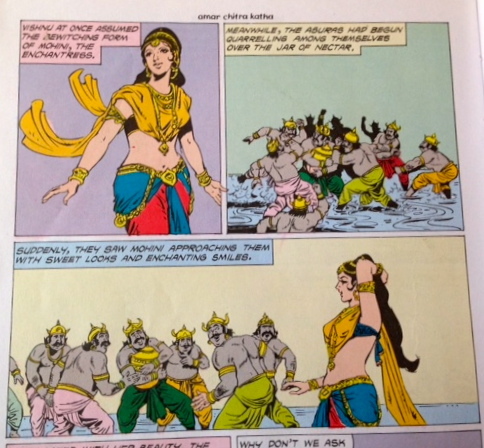 Vishnu then disguised as the bewitching maiden Mohini, appeared before the asuras and cast a spell on them. So enchanted were they by her extraordinary beauty that the asuras asked her to distribute the nectar. Mohini smiled and took the pitcher, offering to help them on one condition- they could not question her actions. The asuras agreed. As they sat in two rows, opposite each other, the devas and asuras waited to be served the nectar. With her smile fixed upon the asuras, Mohini served the devas one by one. Rahu one of the asuras understood that Mohini had no intention of the serving any nectar to the asuras so he took the form of a deva and crossed to the other side. He had just drunk the nectar when Surya, the sun god and Som, the moon god saw who he really was. Their shouts alerted Vishnu who threw his discus at Rahu and chopped his head off, flinging it into the sky. Although Rahu was killed, his head which had taken the nectar, became immortal and even today he takes revenge on the sun and moon by swallowing and eclipsing them. For twelve days and night ( twelve human years) the fight raged. Eventually the devas won and restored Mount Meru to its original position. The deeper you look into this story, the more intriguing it gets. It hints at so many hidden meanings. But, that’s a whole other post – Secrets of The Milky Ocean ! Devas through the guidance of the teacher resort to deception and trickery :). :) I know what you mean. You will often find in myths especially Greek and Hindu ones that morality can be very subjective. Sometimes the end seems to justify the means. But in this particular instance, the asuras were about to de-stabilize the world. They are essentially the ‘bad’ ones. Did you get a chance to read the Secrets of The Milky Ocean? I have put a few interpretations down. There is an important supplement to the story, that of Vishnu giving the asuras the Sanjeevani Vidya so that they may resurrect themselves. Keeping the asuras alive seems critical to keeping the balance between good and evil. I suppose with evil there cannot exist a concept of good.